Sometime after 800 B.C., people began living in small villages. Most of the villages were separated by mountains or the sea. Gradually, several of the villages joined together to become a city-state. Each city state was almost like a separate nation. Overtime there were over 1,500 city-states in ancient Greece. They all spoke Greek, practiced the same religion, and were members of the same culture but they were not loyal to Greece as a whole, but instead they were only loyal to their city-state. The most powerful and respected of these city-states were Athens and Sparta. Athens and Sparta were not much alike. Sparta was an oligarchy that was ruled by two kings and a council. Spartans, were not interested in fine clothes, theater, art, or music. They existed solely for war and their military machine. Children started training as soldiers at age seven. The Spartan military was both feared and respected by the other city-states. Almost entirely different was Athens and its democratic government. Athens was the center of art, refinement, science, philosophy, and political thought. Democracy had developed slowly in Athens, and it had arrived only after a series of reforms under a series of leaders. The word democracy finds its root in the Greek word “demos”, which means “people” in Greek. The Greek system of demokratia, was very different than our present system. This wasn't big government. In an Athenian Greek democracy all citizens were allowed to vote and participate in government. Every citizen was afforded the opportunity to speak in an attempt to persuade the other voters. Citizens had to be born to Athenian parents, and over the age of 21. Women and slaves could not be citizens. 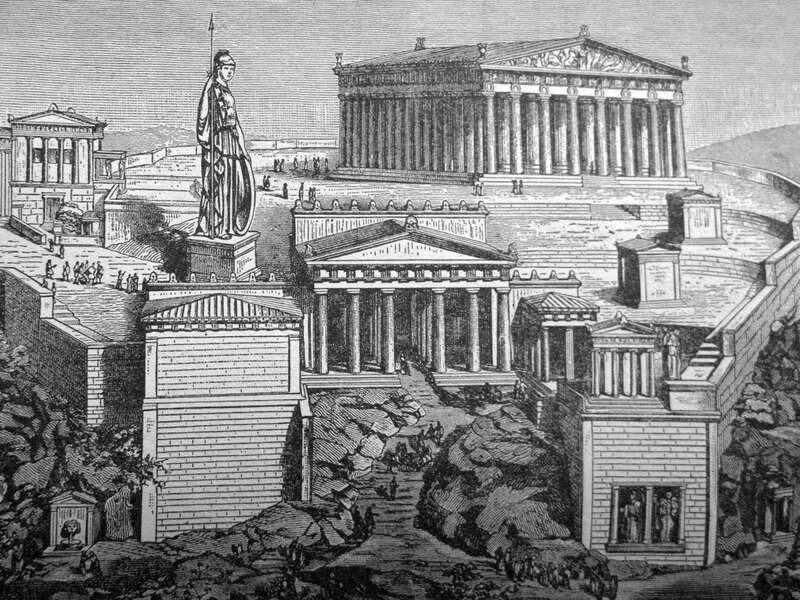 Several people were responsible for the emergence of democracy in Athens. Solon in the 6th century, had come to power during a time of extreme drought and famine. Many farmers could no longer pay their bills and as a result many Athenians were now enslaved. Solon did something drastic, he cancelled all debts and stopped the enslavement of people who owed money. The effect was immediate, his act of kindness eased class tensions in the city. He didn't stop there, Solon continued to increase the power of the average citizen by adding three new political branches. He added a People's Court, where disputes were settled, and a People's Assembly to which all citizens belonged. It met every nine days to discuss the important issues. In addition, Solon added the Council of 400 which was made up of 100 men from the 4 major tribes. Then in 508 B.C., Kleisthenes rose to power in Athens. He wanted to undermine the aristocratic kin groups known as the “gene”. The gene were wealthy aristocrats and had the were now very powerful. Kleisthenes started by linking every persons identity with their village or deme. Next, Kliesthenes divided his citizens into 10 new tribes instead of the 4 that had held all of the power. He then mixed them up so that a single tribe could not become so rich that it would become dominate. At the same time he increased the Council of 400 to 500. Now each tribe was represented by 50 citizens. Under his system the ordinary citizen could no longer be manipulated by the rich.